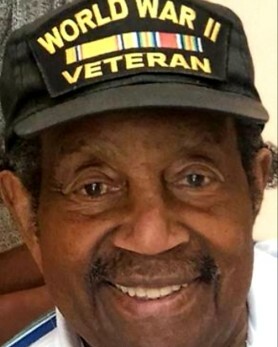 Alden H. Small, Sr., 99, of Tinton Falls, passed away peacefully on January 23, 2019. He was born in Brooklyn NY to the late George T. and Eva (Liburd) Small of Nevis, West Indies. Alden attended Haaren High School in Manhattan NY graduating in January 1938. He was then drafted into the US Army in 1941 and stationed at Ft. Huachuca training for the North African Invasion. During the invasion he went from North Africa through Italy, into Germany where he remained. He was in the all-black 92nd Buffalo Division until after World War II. Alden continued his deployment in Germany as a career workforce instructor making sure all of the soldiers left with a high school diploma before they separated from the service. After WWII all Army black divisions were de-segregated. In 1955, he completed his assignment and was reassigned back to the states. Alden was stationed between Governor’s Island NY and Ft. Monmouth NJ. He retired from the Army Education Division on August 31,1965 as a Master Sergeant. He loved serving his country so much he decided to work in civil service as a signal school instructor. In 1974, he changed career paths and became a technical publication manager for the US Army Communications Electronics Command (CECOM). For 44 years Alden worked, trained, led, and mentored his co-workers finally retiring October 2011 at the age of 92. Alden was an avid reader and he loved African American history, literature and cultural studies. He also enjoyed collecting Black memorabilia from all over the world dating back as far as the 1940’s. He enjoyed listening to big band, following politics and conversing about current events. A Wake will be held at the John E. Day Funeral Home on Thursday, January 31 from 5- 8 p.m. Address is 85 Riverside Avenue, Red Bank, NJ 07701. A viewing will take place at the funeral home on Friday February 1st at 10 a.m. and services will begin at 10:30 a.m. Interment will follow at Monmouth Memorial Park. In memory of Alden, donations may be sent to Listener Supported Radio WBAI 99.5 New York, NY.